3. Nancy J. Montgomery b: 1846 in MO. 3. James Montgomery b: 1850 in MO. 3. Mary Montgomery b: 1852 in MO. 3. Martha Montgomery b: 1854 in MO. 3. George Montgomery b: 1856 in MO. 3. Robert Montgomery b: 1858 in MO. +William Harrison m: 28 Oct 1845 in Lawrence County, TN. +Catharine McBee b: 17 Feb 1840 in Polk County, MO d: 9 Dec 1908 in Seneca, Newton County, MO m: 5 Nov 1857 in Polk County, MO. +Rosa Ann Youcum b: 8 Feb 1894 d: 11 Sep 1969 in Joplin, Jasper County, MO. +Adaline Crabtree b: 18 Jun 1862 d: 5 Jan 1948 in Sale Mem. Hospital, Neosho, MO m: 2 Apr 1882 at residence of the Justice of the Peace, Buffalo Twp., Newton County, MO. 4 James Harry Montgomery b: 24 Jan 1883 in Seneca, Newton County, MO d: 9 Dec 1940 in Seneca, Newton County, MO. 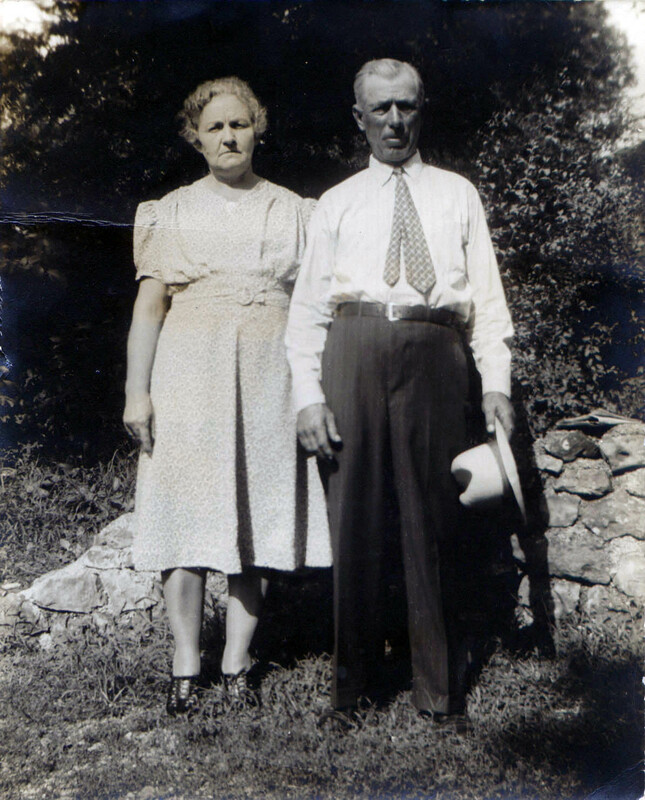 +Cassie Rosetta Roark b: 19 Feb 1890 in Seneca, Newton County, MO. d: 13 Dec 1969 in Seneca, Newton County, MO. m: 12 Apr 1908 in the home of A.C. Roark, Newton County, MO. 5 Naomi V. Montgomery b:. 14 Feb 1909 in Seneca, Newton County, MO d: 13 May 2000 at St Johns Hospital, Joplin, Jasper County, MO. +Lester Watts b: 8 Jun 1903 d: 30 Nov 1990 in Seneca, Newton County, MO. 5 Harry N. Montgomery b: 12 Jan 1912 in Seneca, Newton County, MO d: 10 Oct 1999 in NW Regional Hospital in Springdale, AR. +Leora A. Mailes b: 12 Aug 1917 in Newton County, MO d: 15 Jan 2000 in Seneca, Newton County, MO. 5 Jewel P. Montogmery b: 19 Feb 1914 in Seneca, Newton County, MO d: 5 Mar 2002 in Seneca, Newton County, MO. 5 Eula M. Montgomery b: 29 Dec 1915 in Seneca, Newton County, MO d: 30 Dec 2009 in Seneca, Newton County, MO. +Lannis Elba Campbell b: 10 Mar 1910 d: 10 Mar 1988 in Seneca, Newton County, MO. 5 Vera Montgomery b: 2 Apr 1917 in Seneca, Newton County, MO d: 26 Jul 1984 in Denver, CO.
5 Nelladene Montgomery b: 30 Sep 1925 in Seneca, Newton County, MO d: 4 Jan 2010 in Warrensburg, Johnson County, MO. +Danny Bottero b: 7 Nov 1918 in Frontenac, Kansas d: 8 Aug 2006 in Warrensburg, Johnson County, MO. 5 James Junior Montgomery b: 9 Oct 1922 Seneca, Newton County, Mo d: 22 Jul 2017 Joplin, Jasper County, MO. +Ida B. Taylor b: May 1884 in MO d: 19 Mar 1945 in Seneca, Newton County, MO m: 6 Oct 1903 in Seneca, Newton County, MO. +Mildred Juanita Corp b: 5 Jul1913 m: 24 Nov 1931 in Joplin, Jasper County, MO. 4 Lloyd Montgomery b: 19 Jun 1906 in Seneca, Newton County, MO. d: 19 Feb 1916 in Seneca, Newton County, MO. 4 Ralph Carlos Montgomery b: 9 Feb 1912 in Seneca, Newton County, MO. d: 1 Feb 1994 in Joplin, Jasper County, MO. +Virginia Marie Ederath Mills b: 17 Jan 1921 m: 10 Feb 1940 in Carthage, MO.